Xerox Star 8010 Interfaces, high quality polaroids (1981) « Adafruit Industries – Makers, hackers, artists, designers and engineers! Gorgeous – Digibarn: Xerox Star 8010 Interfaces, high quality polaroids (1981) via DF. 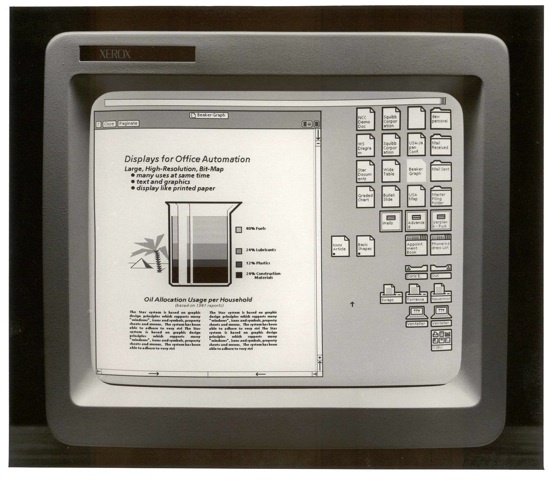 The following are scans of high quality polaroid photographs of the screen of the Xerox Star 8010 workstation on its launch in 1981. Some of these photographs show earlier icon development. See Norm Cox’s even earlier Star icon development pages to look at the evolution of Star’s icons up to this final product. I worked at Xerox in the ’80s and had access to the Stars in the office. It was rather slow because of the limitations of computing power at that time (bit-sliced microprocessor), but with that gorgeous high-resolution grayscale display, we did not notice that nor the absence of color. It was my first access to the Internet and I spent much of my spare time reading the newsgroups (net news as it was known at the time). The Star and the first laser printers. It’s amazing that Xerox did not become more successful with this early technology. We had an internal joke that Xerox should become a nonprofit since we invented so much stuff to make others so much money.